Fajitas are one of those dishes we never grow tired of. Whether we use Soy Curls or Portabello mushrooms, they always taste delicious. When we owned our own market, we often fixed these with what we called “discount” ingredients. 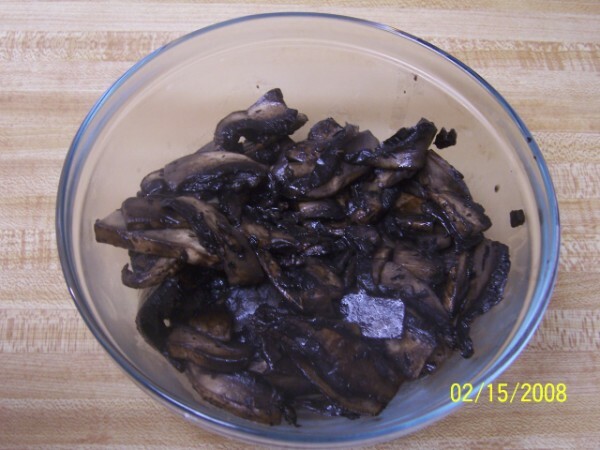 The dish is pretty forgiving, so it is a great recipe to use when the mushrooms, onions or peppers are starting to show a little wear. The ingredients for this dish can vary greatly depending on the number of mouths you have to feed and each person’s personal preferences. 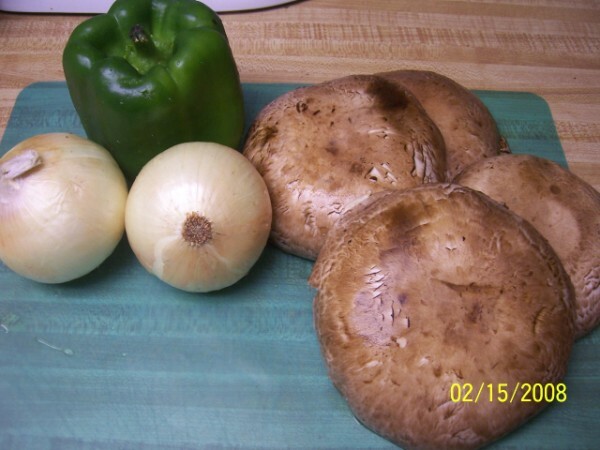 My husband loves lots of peppers, I love lots of onions, and my children love the mushrooms – only. As you will see, I prepare the mushrooms in a separate pan so my kids can have their fajitas without them being contaminated by peppers and onions. 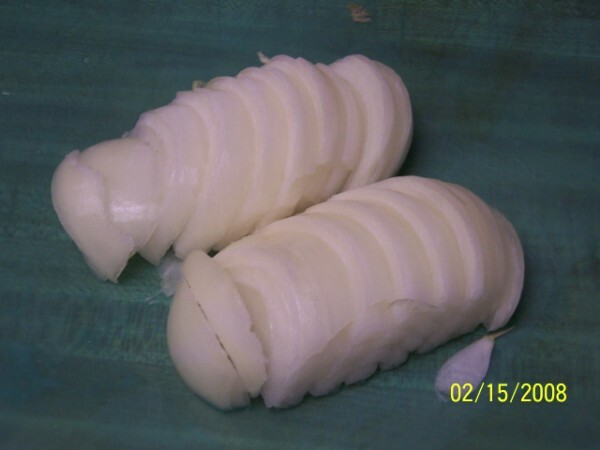 Start with peeling the onion and slicing it lengthwise to give nice long strips. 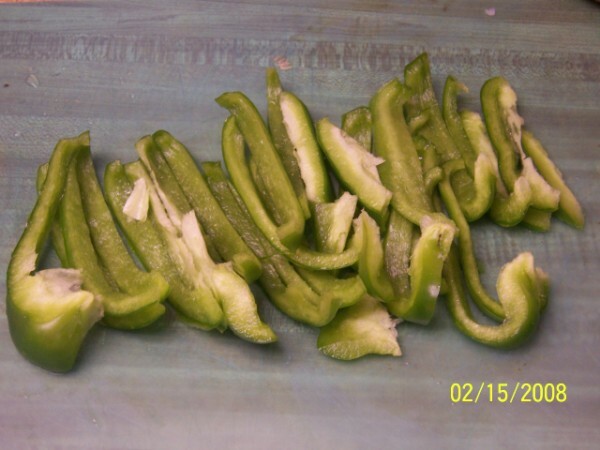 Slice the pepper, any color will do, and remove the seed pod. I used to do this with a knife and found that it took more time and involved more risk than snapping the seed pod out with my fingers. 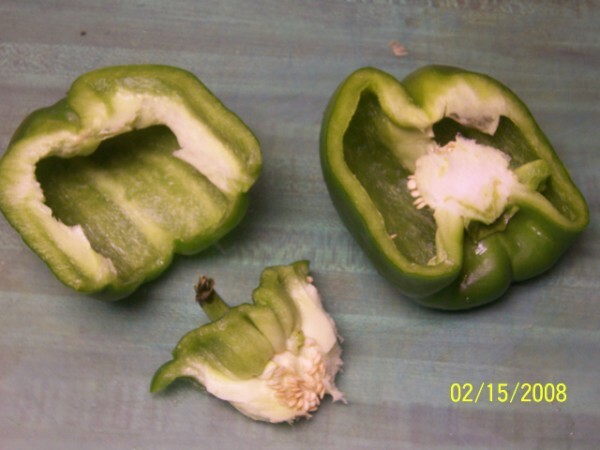 Rinse the pepper inside and out once the seed pod is removed. Then slice the pepper into long thin strips. 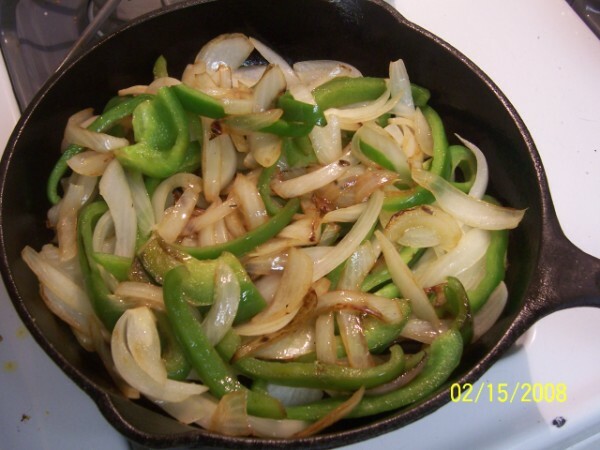 Add onions and peppers to cast-iron skillet. Then add some oil which will handle the high heat. This is one dish where I feel both the cast-iron and a high-heat oil are necessary. 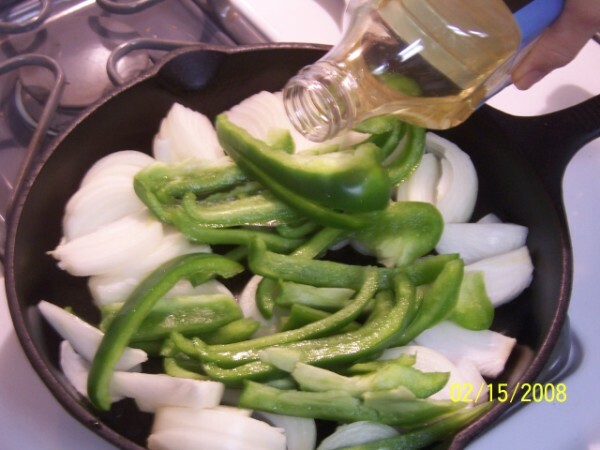 I like to cook my fajitas at a very high heat so I make sure to use peanut oil which can handle the high temperature without smoking. I only use about 1 or 2 tablespoons of oil. MMMMM….Almost done. Make sure to stir the mixture occassionally while cooking. 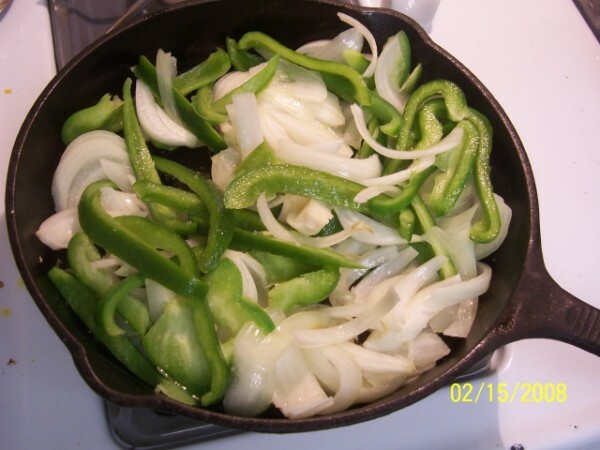 Sometimes, I will place a lid on top to help hold the heat and soften the peppers and onions quicky. If you like your fajitas with a little more texture, you could stop when they look like this. We like ours a little softer so I will let them cook for about another 2-3 minutes. Now we’re talking scrumptious! These look perfect! Nice and carmelized and ready for eating. Time to remove them from the pan. 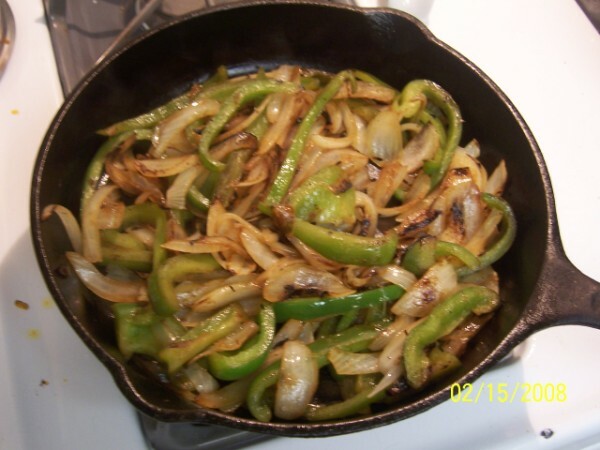 Remember that I cook my peppers and onions separately from the mushrooms because my kids don’t want peppers and onions on their fajitas. 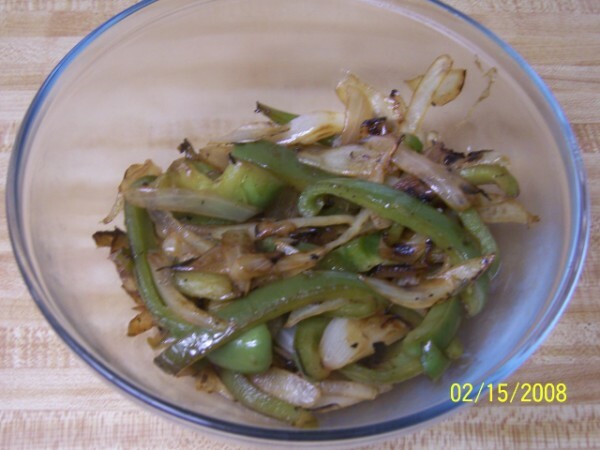 Time to remove the peppers and onions and get them ready for serving. If I wasn’t going to make some portabello mushrooms, I would serve these in the cast iron skillet. Serving them at the table from the skillet keeps them warm longer and looks so authentic! But tonight, a nice bowl will have to do! Now for the mushrooms! 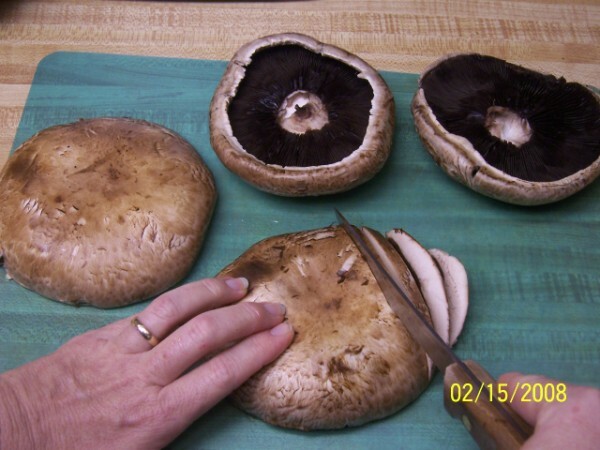 Start with some portabello mushrooms which are nice and firm and not slimy. 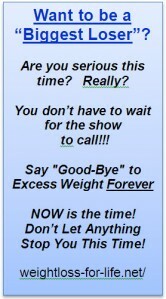 (If yours have gone a little limp, it’s okay to still use them. In this dish, you won’t even notice!) I give my mushrooms a quick rinse under running water and shake off the excess. True mushroom gourmets will probably tell you not to do this – but it works for me. Taking the time to gently wash the mushrooms or rub them – well, that just takes too long! Since I am going to be frying these up, I don’t bother to remove the “black gills” underneath the cap. Some recipes will call for this, however, unless you are really concerned about the appearance, don’t bother. Make sure to slice the mushrooms nice and thin. I like to cut mine to approximately the same size as the peppers and onions. 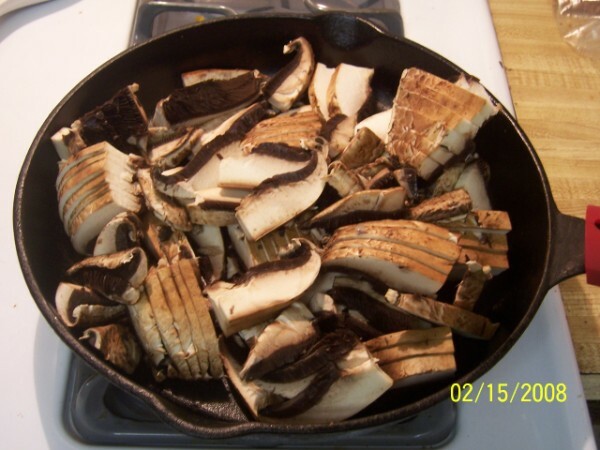 Place the portabellos in the cast iron pan you just used for the peppers and onions. Sometimes I will add a little more oil, but they generally don’t need it. The little bit of water left after washing the mushrooms is enought to get them started. Once the portabellos begin to heat up, they will release quite a bit of water and they won’t stick to the pan. Usually I cover the pan with a domed lid for a few minutes to help hold the heat in and get the portabellos nice and hot quickly. Stir them a few times while cooking and remove them before they get too limp. Wow! These look great and ready to stuff a big fajita! My kids love these portabellos by themselves in their fajitas. My husband and I include a large portion of peppers, onions, guacamole and salsa! My mouth is watering just thinking about it!